The design of the bag is simple and fairly slender, with sturdy material that doesn’t feel flimsy. The straps are comfortable and rest well on your shoulders, and the standard torso buckle meant to take pressure off your shoulders does it job fairly well. The overall design is sleek and unobtrusive, and doesn’t particularly scream “expensive goodies inside”. For me, the design of this bag is actually one of my favorite aspects, it’s definitely a step above most of the bags I’ve used in this price range. When looking at a bag, one of the primary factors for me is if it’ll be comfortable after long periods of wear, and in my experience it was. While the actual bag is a main factor in this, you should also be mindful that how you pack the bag is going to have a significant impact on how it feels. 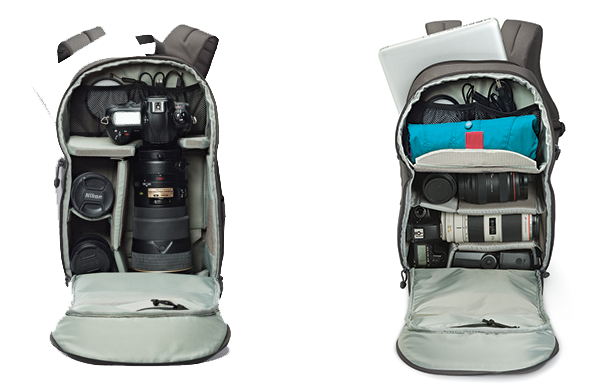 On the outside you’re provided with a side access zipper to reach your camera body, a small front pocket, a mount for a small tripod or monopod on the side, a rain cover that pulls out from the bottom of the front flap, and a separate compartment for a 15″ laptop. The inside is compromised of a top portion for accessories, snacks, and whatever fits your fancy, which takes up about 40% of the bag, while the bottom portion is reserved for your gear. You’ll find another zippered pocket on the inside, as well as several elastic pouches for batteries, SD cards, etc. 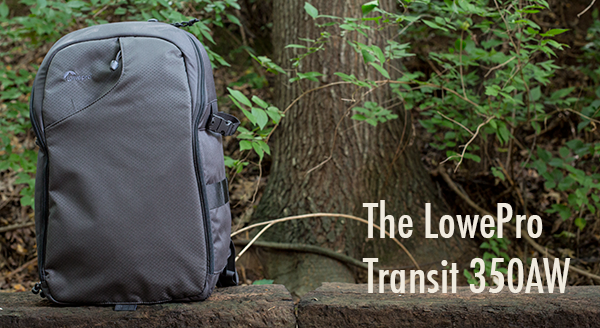 LowePro has also designed the 350AW to transform depending on your needs, including a removable partition in where the top of the bag meets the bottom portion. Replacing it with an included alternative allows you to stow a body with a 300mm lens attached, but at the expense of losing a good portion of top storage space. Other configurations allow for a “pro” body plus a 70-200mm 2.8, or even removing all the bag partitions. While these customization options are nice to have, I feel as if their implementation could be better. The use of any other lens than a 300m or 70-200 2.8 on your body results in a lot of wide open space that I wouldn’t trust my gear to, there’s simply nothing to hold a smaller configuration in place. When using either of the above configurations, you’re left with room for a few essentials, perhaps one flash and one zoom lens or two primes. But the purpose of this pack isn’t to help you carry the kitchen sink, it’s to allow for the essentials you’ll need on a trek. The 350 is a good bag when you accept it’s constraints. If you’re looking for a solution to simply stow a few select pieces of gear until you get to your location, or if you’re on a hike and need a place to stow your body in-between Yeti sightings; I think you’ll find it’ll fit the bill well. LowePro does offer a “sling” version of this bag, which I believe would be more well suited to fast paced shooting environments. The 350 will be my go to when I’m headed out to a small portrait shoot with minimal on-location movement, with all my essentials inside and the ability to strap my collapsible softbox and tripod to the side. Great if you simply want a way to transport gear without event-shooter style access.